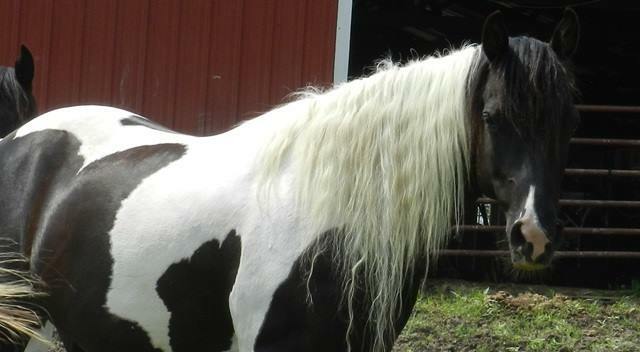 Taffy is a 2003 black/white Pintabian mare with great beauty and conformation with 50/50 markings. She has an exquisitely dished face and stands at around 15.2 hands tall. She is the dam of our double homozygous mare, Sadie. An extremely sweet and personable mare, she is trained to ride and has been out on trails. This mare will do anything you ask of her and look beautiful doing it. Sadie is a 2010 double homozygous black and white Pintabian mare. Currently in training to be ridden, Sadie is a sweet, beautiful mare with a bold look and stunning Arabian features. She stands around 15 hands tall and carries herself high and proud, much like her mother. Sadie is registered in both the Pinto and IPAR registries.